LAKEWOOD – Millions can’t be wrong. The Lakewood BlueClaws have attracted 7,403,363 fans to FirstEnergy Park for regular-season games since beginning play in 2001 as the Philadelphia Phillies’ low Class A affiliate. The march to eight million continues Thursday, April 4 when Lakewood hosts the Hickory (N.C.) Crawdads, a Texas Rangers farm team, at 6:35 p.m. in South Atlantic League action in the regular-season opener for both teams. There’s something for everyone at FirstEnergy Park. Shoot a round or two of miniature golf. Enjoy the boardwalk style games. Sample food and drinks and listen to live bands at the BlueClaws Biergarten. Check out the items at the Claws Cove, the team’s gift shop. Enjoy the berm. Lakewood won the SAL in 2006, 2009 and 2010 and played for another title in 2016, falling in the Championship Series. Lakewood last year won the Northern Division title during both halves of the season. The BlueClaws finished with the league’s best overall record at 87-51 for a .630 winning percentage. A total of 89 former Lakewood players, led by former Philadelphia stars Ryan Howard and Cole Hamels – made it to The Show through last season. Howard is in his first year as an ESPN analyst. Hamels pitches for the Chicago Cubs. 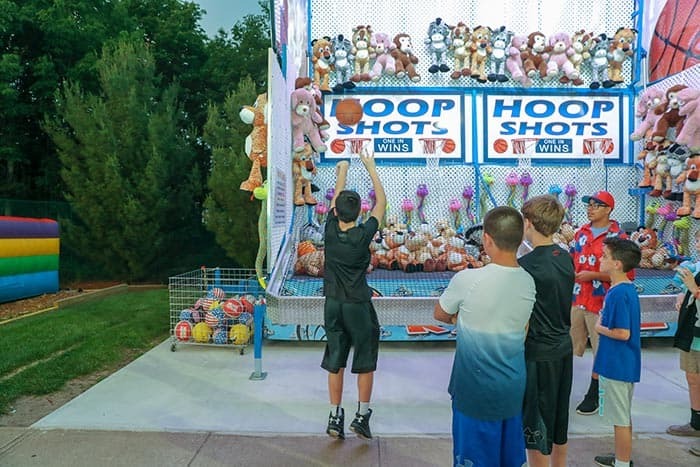 “Baseball and entertainment are not mutually exclusive,” said Joe Ricciutti, the BlueClaws’ president and general manager. “Entertainment is what we focus on. We will have more fireworks than ever – 26 fireworks nights. We will have new skits to keep the fans laughing and smiling during the 90 seconds between each inning. Those 90 seconds are critical for the fan entertainment experience. There are so many things going on here that you won’t be bored. “This is a full entertainment venue and baseball is a part of the entertainment that goes on at FirstEnergy Park,” he said. Enjoy the revamped Investors Bank Picnic Areas. They include new seating, better views for fans and new menus. The improvements mark the second phase of the five-year capital improvement plan that began last year. Both have new, comfortable mesh swivel seats, tables and food service capabilities. The re-design includes turning the Third Base Picnic Area adjacent to the BlueClaws Biergarten, which opened last year, into an area designed for business and networking opportunities. 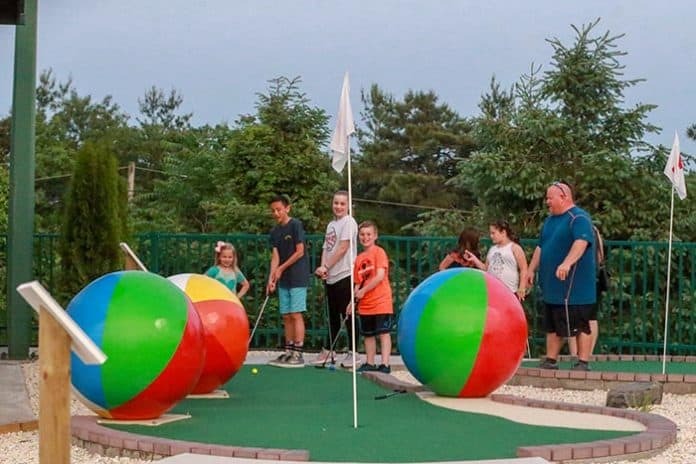 The First Base Picnic Area, close to Mini Golf, Shore Town Soft Serve and the Boardwalk Games, is geared toward family outings. 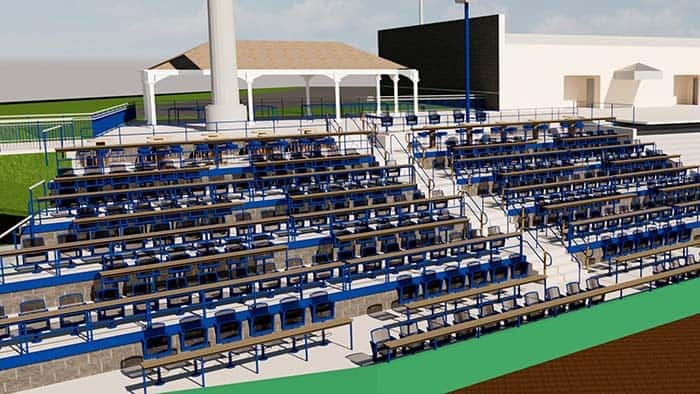 The business centric area on the third base side includes four tiers of seating, each with a row of semi-circle tables with swivel chairs and a high-top table just behind. The first base area includes four tiers of seating, each with food rails facing the field and high top tables just behind. Each area will have a new private bar open exclusively for groups. An addition to the entertainment schedule is Fiesta Friday. During each home game, there will be food and drink specials and music. Fireworks will be shot off after all Friday home games and beginning in June after each Thursday and Saturday game. Medusas de Lakewood will debut May 3. It’s a part of Minor League Baseball’s Copa de la Diversion national program. Each Copa game – May 3, June 23, July 26 and Aug. 28 – will feature live music, food and drink specials and a celebration of Hispanic and Latino culture and heritage. Thirsty Thursdays will feature discounted beer and food. There also will be bobblehead events, numerous other giveaways and fan promotions. The video board beyond the outfield fence will feature new skits. Shore Town Baseball, a group led by minor league baseball veteran Art Matin of Brooklyn, N.Y., acquired the BlueClaws from the American Baseball Company, the team’s original ownership group, during the 2017 season. The group added the Mini Golf Course, the Home Run Pavilion (the boardwalk game area) and the Biergarten last year. Lakewood’s player development contract with the Phillies runs through the 2020 season. The Phillies pay Lakewood’s players and provide the team with its players, manager, coaches, training and medical staffs. Lakewood often hosts Philadelphia players on injury rehabilitation assignments. Baseball Beats: Angelina Bella of Brick Township will sing The National Anthem for the opener. The team’s main public address announcer will be Jeff Fromm of Staten Island, N.Y. He takes over for the club’s original announcer, Kevin Clark, who retired. Clark, a Barnegat resident, has served as the New Jersey Devils’ main public address announcer. Hundreds of people work for the BlueClaws when the team plays in Lakewood. A Lakewood player to watch is third baseman Alec Bohm, selected third on the first round of the June draft by the Phillies last season after his junior year at Wichita State University. He accepted a $5.85 million signing bonus, more than $1 million less than the pick’s slot value of $6,947,500, according to thatball’souttahere.com. The Phillies put the remainder of the money toward other draft choices. The 6-foot-5, 225-pounder was a Baseball America first-team All-American as a junior after hitting .339 and slugging 16 home runs. He batted a combined .252 with 17 runs batted in and three stolen bases, playing for three minor league teams in 2018. MLB Pipeline ranked Bohm and Baseball America ranked Bohm as the top and second prospect in the Phillies’ minor-league system. He’s ranked third in the Phillies’ minor-league system by Baseball America. The switch hitter from the Dominican Republic signed a $2.5 million bonus on the first day of the 2017-18 international signing period, industry sources said. A Lakewood pitcher to watch is righty Colton Eastman. Chosen by the Phillies on the fourth round last season out of Cal-State Fullerton, he was 0-2 with a 3.00 earned run average for the Williamsport (Pa) Crosscutters of the New York-Penn League, a short-season Class A circuit. He appeared in and started eight games, striking out 23 in 18 innings. Eastman, who allowed seven walks and 18 hits, signed for a $522,900 bonus, according to Baseball America. Lakewood’s manager is Mike Micucci, who takes over for Marty Malloy. The latter guides the Clearwater Threshers of the Florida State League, an advanced Class A circuit. Micucci spent the last three seasons in the Seattle Mariners’ organization most recently as their coordinator of organization instruction. Malloy, the winningest manager in Lakewood history, led the BlueClaws to 160 wins in two seasons. Extra innings will begin with a runner on second base. SAL teams are scheduled to play 140 regular-season games, including 70 at home. Most of its players will be in their first full professional seasons.